HUDSON FALLS — Annette Louise Marple, age 91, died Sept. 16, 2018, in Lubbock, Texas. Annette was born on Sept. 15, 1927 in Hudson Falls, a daughter of Albert and Essie Wilson. 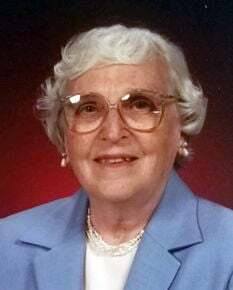 She graduated from Hudson Falls High School in 1945 and from the University of Rochester in 1949 earning a Bachelor of Arts degree in Government and Economics. In 1953 she received a Master of Arts degree from the Institute of Labor Management Relations of the University of Illinois, and in 1973 a Doctor of Jurisprudence degree from the School of Law of Texas Tech University. From 1973 to 1992 she was a member of the Texas Tech School of Law faculty teaching in the area of Property Law, serving seven years as Assistant and then Associate Dean and for eleven years serving as chair of the Law School’s Admission Committee. In 1950 she was married to Hugo D. Marple and lived in Indianapolis, Indiana and then Stevens Point, Wisconsin where Hugo chaired the music departments of Indiana Central College and then Wisconsin State University Stevens Point before moving to Lubbock, Texas in 1969, where he was on the faculty of Texas Tech University. Prior to moving to Texas, Annette was active in her local church, in university faculty wives organizations and took leadership roles in state and local political party organizations. As a member of the First United Methodist Church in Lubbock, she served on the Everliving Church Trust Committee, on the Board of Trustees, and participated in the United Methodist Women’s organization and the Homebuilders class. Annette is survived by her son, Craig (Kay) of Spencerport, daughter, Karen Kreiser (Thomas) of Beloit, Wisconsin, daughter Elaine Illes of Tampa, Florida; nine grandchildren, Justin Marple of Brighton, Erin Hall (Brad) of East Bloomfield, Katlyn Marple of Brighton, Massachusetts, Ross Marple (Erica) of Victor, New York, Daniel Kreiser, Michael Kreiser, Matthew Kreiser, Andre Illes, Evan Illes; great grandchildren, Wyatt, Zoe, Hugo, Nora; siblings, Harriette Greaser of Albion, New York, Donald Wilson of Madison, Alabama, Robert Wilson of Street, Maryland, and Calvin Wilson of Pittsburgh, Pennsylvania. She was preceded in death by her husband Hugo, an infant son, Neal Marple, and sisters Jane Wilson, Ellen Marple. Friends and family will be received from 9 to 10 a.m. on Saturday, Sept. 29, 2018 at Kepner Funeral Home, 166 Kruger Street, Wheeling, WV (304-242-2311) where funeral services will be held at 10 a.m. with her brother, Rev. Calvin C. Wilson officiating. Interment will be immediately following in Greenwood Cemetery. Personal Condolences can be expressed online at Kepnerfuneral.com.